It is never too early to track a child's progress. When your child reaches preschool age there are a wealth of skills to master to ensure that she is prepared for kindergarten and on the track to success. Printable preschool progress reports help you pay attention to those skills by documenting that your child has met them. You may choose to use printable progress reports in multiple ways. These progress reports can help ensure a child has met the necessary skills when it's time for their preschool report card. If you need help downloading the printable, check out these helpful tips. Certain progress reports contain a single skills checklist where you write the date when the skill was mastered and any relevant notes. You can fill out the progress report twice during the year to see how your child has developed. 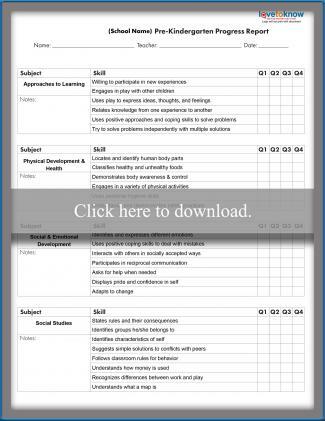 You can also print this type of progress report to continually monitor your child's progress. Other progress reports allow you to monitor the progress quarterly by checking off the progress toward specific skills each quarter and provide any necessary notes. This type of progress report helps you more easily monitor a child's growth and development throughout the school year. 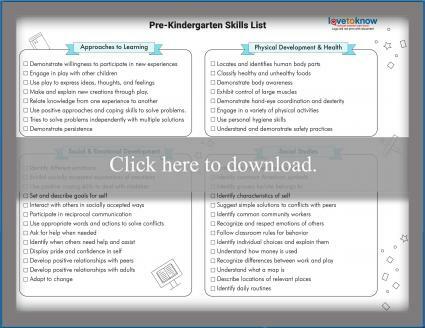 These skills have been adapted from the World Book Typical Course of Study for Preschoolers to represent the basic skills that should be included on any preschool progress report. 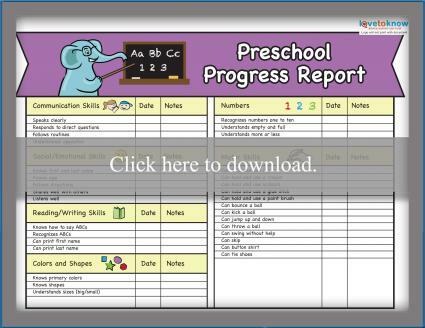 Knowing these can help parents and teachers create their own preschool report card templates. Although people use the terms interchangeably, prekindergarten, or Pre-K, is a much more comprehensive program than most preschools. The skills included in the New York State Prekindergarten Common Core and the Pennsylvania Learning Standards for Early Childhood serve as comprehensive examples of what differentiates Pre-K from preschool and are the basis for this quarterly Pre-K report card template. Use the editable document as is or change the subjects and skills to align with your school's standards. Pre-kindergarten early learning standards vary from state to state, but most include similar goals and objectives. The standards in your state will determine what should be included as skills on your progress reports. In terms of Pre-K, skills are broken down more by areas of learning than specific subjects and focus on a cohesive education for young children. You can use this checklist as a progress report by marking the boxes next to skills the child has mastered or use it as a list to pull skills from for your report card. 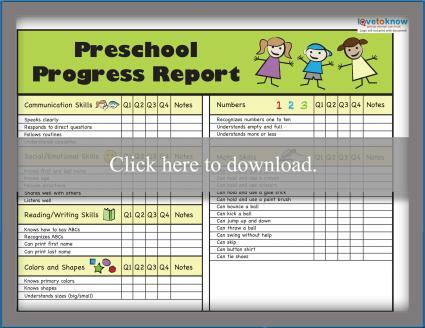 While the purpose of the progress reports is to show you whether your preschooler is able to perform necessary skills, you can also share the reports with your child. 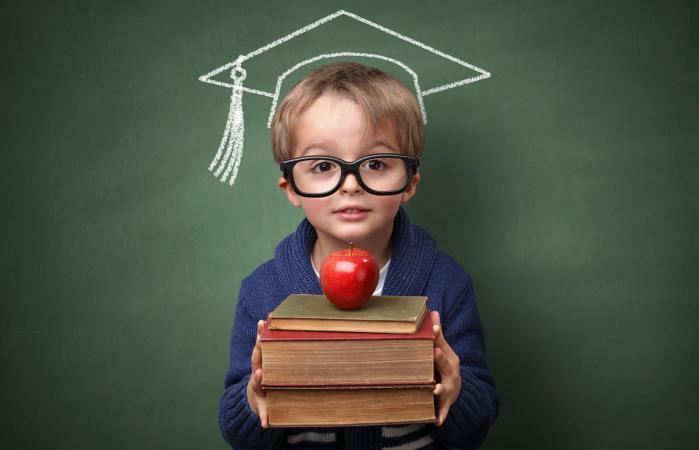 Even preschoolers can set small goals and work toward them. Tell your child what skills you are working on and show him what skills he has already learned. Sharing a progress report with your preschooler will give him a chance to revel in his success and give him something to work toward.